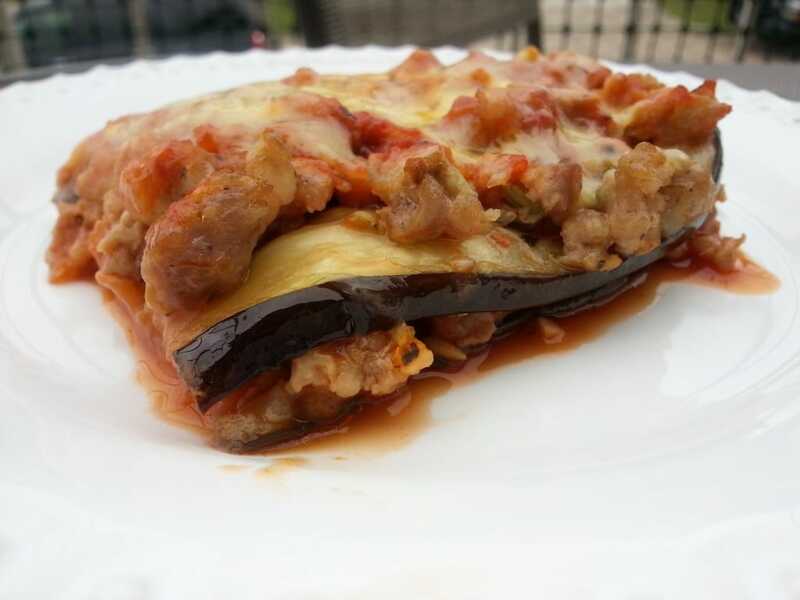 When you think of an eggplant lasagna — it’s commonly a vegetarian dish. We’re not subbing this meat in this recipe, because well, animal protein is awesome! Instead, we’re booting out the noodles and replacing them with sliced roasted eggplant. With one tablespoon of the olive oil, lightly brush each side of your sliced eggplant. Roast the eggplant slices on a baking sheet for 10 minutes. Meanwhile, heat another tablespoon of olive oil over medium. Add the Italian sausage along with half of the shallots and garlic. Continue to cook until sausage is browned. Remove from heat and set aside. By this time the eggplant slices should be done. Remove from the oven and set aside to cool slightly. Time to make the sauce — in a medium saucepan heat the remaining tablespoon of olive oil over medium heat. Sauté the rest of the shallot and garlic until translucent and fragrant. Add the dried basil and oregano — and sauté another minute or so. Add in the tomato sauce. You can use some salt to your liking at this point. Bring to a boil, reduce the heat to low and allow it to simmer 10-15 minutes. Once the sauce is done, spoon a small amount onto the bottom of a 9×13 baking dish. This will prevent the bottom layer of eggplant from sticking. Next, layer your ingredients — 1/2 the eggplant, 1/2 the sausage, 1/2 sauce, and then continue one more time — until all ingredients are used up. Sprinkle the top of your dish with the grated cheese. Bake in the 400 degree oven for 20 minutes, or until the lasagna is heated through and the cheese is melted and bubbly.